2. Dimensions(mm): 110(W) x 100(H) x 340(L). 3. Suitable camera size(mm): 76(W) x 62(H) x 220(L). 1. Built-in heater & blower. 2. 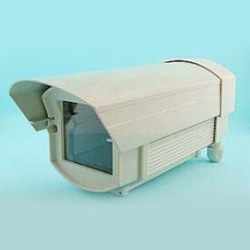 Control temperature: heater: on: 15°C off: 25°C / blower: on: 35°C off: 25°C. 3. Optional input voltage: 12VDC/24VAC/110VAC/220VAC.